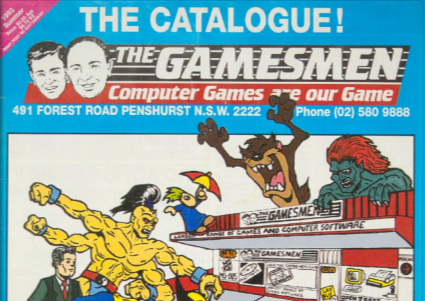 Home > The Gamesmen > Relive how people shopped for games before the Internet! Relive how people shopped for games before the Internet! One of Australia's oldest and most respected independent game retailers, The Gamesmen, did a really cool thing today. The company put its library of old print catalogues from the 90's and early 00's up on its website. That won't mean much to younger readers, but for us older people, there's real nostalgia in that. Before the Internet was a really mainstream thing, and certainly before every gaming publication went online and Twitter and Facebook made talking about games with other people easier than ever before, the physical, printed catalogues that retailers would send out were a critical source of information on which games we would be buying and getting excited for. The Gamesmen produced some of the best catalogues in the business. Back in the day I would remember getting excited every couple of months that a new one had arrived in the mail. As a kid I would basically get two opportunities for new games; my birthday, and Christmas, so I would spend hours studying these catalogues, weighing up carefully which games I would be asking for for Christmas. It sounds silly now, I know, but as someone who was way into games, that's how I did it. That and the occasional games magazine (though those cost money, so they were a bit of a luxury in themselves). Anyhow, waxing nostalgia aside, I had a long around the library of old catalogues, and I had to laugh, because I actually remember the design and layout of some of them. I even remember the description of the occasional game. If you want to check out these catalogues, click the link below. If nothing else it will amuse you to see just how much the conversations around games have changed since then. On a slightly sharper note, it is both amusing and very depressing that a better job has been done to archive these game catalogues than many of the games and software featured in them. A lot of stuff in there is simply unavailable anywhere, and that, again, is something the games industry needs to urgently fix.